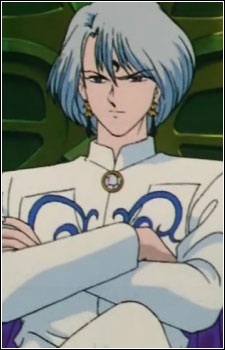 Prince Dimande "Dimando, Demand, Diamond"
Prince Dimande (Prince Diamond in the English dub) is the leader of all of Planet Nemesis in the 30th century. Born on a prisoners' planet, Dimande's original intention is to reason with Neo-Queen Serenity, explaining that he and his people are descendants of criminals, and not actually criminals themselves. However, Wiseman slowly manipulates the young prince to be unforgiving to the people of Earth. One day, during an attack on Crystal Tokyo, Prince Dimande manages to see Neo-Queen Serenity and falls in love with her. He seems to be fascinated with her eyes, and the anger they bore toward him during the glimpse they caught of each other. In all versions of Sailor Moon, including the musicals, Demand's deep obsession with the Neo-Queen eventually drives him to kidnap her past self and attempt to brainwash her with his third eye into becoming his Queen. In the anime, Sailor Moon is saved by Tuxedo Mask from Prince Demand's castle. In the manga, she saves herself and Ami, Rei and Makoto. Prince Demand's final moments are different in every version of the series. In the manga, he is killed by Sailor Moon and Tuxedo Mask after he attempts to combine the Silver Crystals of the future and the present in a fit of insanity after realising that he was used by Wiseman.